U.S./Turkey Dispute, Seasonal Fundamentals Could Sink Cotton Prices – Thrakika Ekkokistiria S.A. I am a strong proponent of NEVER trying to trade off of mainstream news stories. That being said, this does not mean there can’t be less obvious, fundamentally based plays as a result of such stories. In this month’s update, we present a new opportunity for selling options in the Cotton market. The latest trade dispute between the US and Turkey has roiled currency markets for the past week. As a result of President Trump doubling steel and aluminum tariffs on Turkey, the lira is crashing vs. the dollar. Pundits are wringing their hands about possible “contagion.” Good luck trying to trade that. That has more moving parts than a Swiss watch. One thing for sure, however, is that the US/Turkey relationship is strained, and not just on the economic front. A recent editorial in the Wall Street Journal suggests that Turkey should be expelled from NATO. 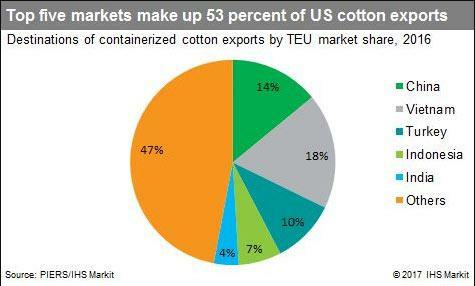 Turkey is a key importer of US cotton. For the first 6 months of 2018, the country imported $563 million worth of US cotton, a little over 10% of all US cotton exports. The US is the top supplier of cotton to the Turkish market, accounting for 30% of all Turkish cotton imports. It is likely that as a result of the recent tension, Turkey shifts at least some of its cotton business away from the US or, they could choose to respond by slapping additional import duties on US cotton – potentially having a more outsized effect. Does this have a major impact on US cotton prices? Possibly. At the very least, it’s not a bullish development for US cotton prices. This is especially true considering that top US importer China is already shifting its cotton orders beyond US shores. And given the other challenges cotton prices face in the months ahead, it could be a scale tipper. 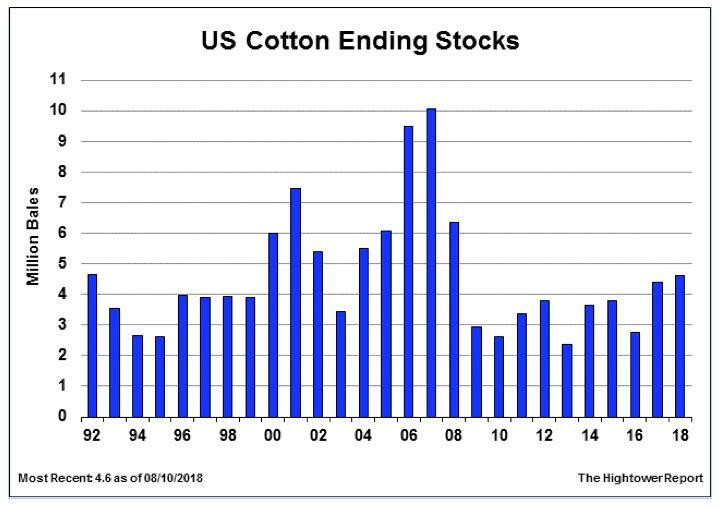 US Cotton Ending Stocks will be the highest in 10 years for the 2018/19 crop year. While world stocks falling slightly from last year will likely prevent a glut, the US supply picture presents a backdrop of adequate supply. This is typically enough to keep a lid on surging price rallies. 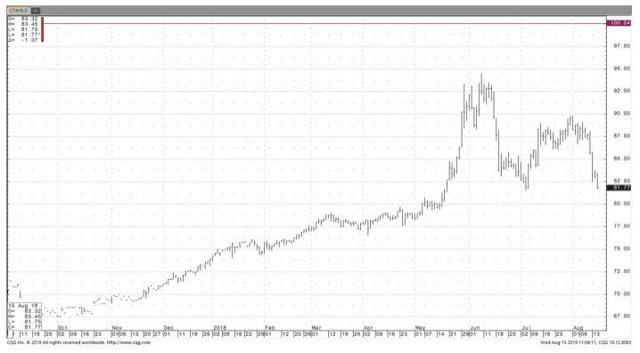 But cotton prices have another, more immediate factor with which to contend. And it’s not friendly to the bulls. It’s the time of year. Seasonal price tendencies can be powerful forces for agricultural commodities. In the US, commodities such as corn, (spring) wheat, oats, soybeans, and cotton are planted in the spring, grown in the summer, and are harvested in the fall. As the crop is harvested and goes “into the barn,” supplies will tend to build. In fact, at no time during the year will supplies be higher than the time immediately after harvest. As a result, economics 101 dictates that when supplies are most ample, prices will reach their lowest levels. This basic economic function often plays out over and over again in the US Agricultural markets. And it happens on an annual basis. Cotton is no exception. As harvest progresses into fall, supplies tend to build and prices tend to fall. This tendency is illustrated in the seasonal chart below. With September approaching and the US cotton harvest now around the corner, seasonal tendencies favor the bears. Prices have historically tended to decline into harvest. With 2018/2019 US cotton ending stocks now surging to the highest projected levels in a decade, supplies appear ample for the upcoming crop year. The US/Turkey trade dispute will not help cotton prices. Regardless of currency swings, the end result is likely less US cotton exports to Turkey – a key importer of US cotton. 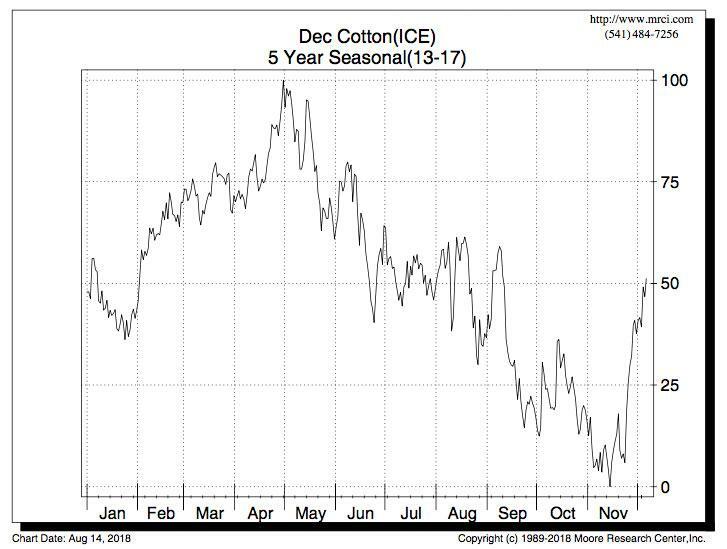 Does this mean cotton prices are set for a tumble? Not necessarily. Prices have fallen nearly 14% since May highs. In addition, the market may have already priced much of the expected higher ending stocks. That being said, it now appears unlikely the cotton can stage a significant price rally into the end of the year. The US crop is all but “made” and thus now out of danger. Any major yield surprises are unlikely going forward. And prices will be fighting seasonal forces for the duration of the year. This is a solid set up for call sellers. In our managed accounts, we’ll be targeting deep out of the money strikes on limited price rallies over the next 30 days.